The pairing of two colors of gold - yellow, white, rose - makes this petite circular pendant a standout. Choose from over 270 sayings – romantic, motivational, spiritual or humorous – and we will translate it for you into elegant Chinese symbols. 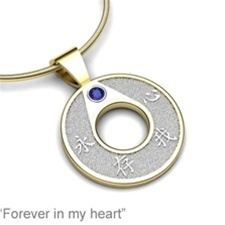 The pendant holds up to six characters. Accessory: Add a beautiful Necklace Chain, Chains available in Sterling Silver, 14K Yellow and White Gold, and in 16 and 18 inch lengths.